We all have come across various challenges in our lives, whether it is in work, relationships, or our personal fitness. Sometimes it feels hard to keep on going forward. But our body and mind are amazing instruments, and are capable of greatly exceeding our own expectations – So what can you do to succeed? After spending 9 years in the Royal Air Force as a Physical Training Instructor, believe me – I have seen and experienced many highs and lows in magnitudes of situations. Being in the military kind of does that to you, you are regularly challenged and pushed to the point of physical and mental exhaustion. There are times when you feel on top of the world, but there are also times when you are tired, lonely, and miserable, but you still have a job to do. This experience taught me that the human body is capable of so much more than I thought possible, and I know that when things get tough i.e. hitting the wall, I often do have what it takes in me to overcome this. Lizzie regularly takes part in endurance races such as the Superhuman Games to challenge her own limits. ‘Hitting the wall’ is often mentioned in endurance events, when individuals believe that they have reached their physical limits and cannot go on. However, our bodies will usually have more in the tank to push on. When I use the term ‘Hitting the wall’ I relate it to more than just endurance events. I believe it relates to pretty much everything in life, work, fitness, social, and even sometimes just getting out of bed in the mornings can be seen as a challenge. But once you get through the ‘wall’, you will see that nothing changed physically. If it was a race, you didn’t grow new legs. If it was in the workplace, you simply found a way to solve the problem. No one carried you, only your determination and motivation got you through the challenge. Basically, the wall is not real, but is a psychological barrier that you think will stop you on your journey. Getting over the wall is not going to be easy road, but easy is comfortable and being comfortable doesn’t make you grow to achieve your ambitions. It doesn’t make you the best version of yourself that you can be. To overcome this invisible wall in front of you, you don’t need to be born mentally tough, or have a wealth of physical training experience. But, what you do need is the understanding of what it takes to develop your mental determination – master these and there is no stopping you! The model that I follow and one that I advise to all my clients to ‘Get over/through that wall’ is known as the 4C’s of Mental Toughness, which was put together by Clough, Earle & Sewell (2002). Stop making excuses for not hitting the gym, or that you are too busy to make the right choices about your nutrition. Life does get hard, jobs and family life can be stressful, but that doesn’t mean you have to go on living like that. Make a plan of what you want your week to look like – can you switch mindless browsing on social media to a gym session or a walk? How much money do you spend on new clothes or nights out? Can you invest that same money in your health? If you know you have a hectic week at work, then make sure that you stay focused on that. Then once things have calmed down, use this time wisely to focus on your well-being. Accept that things will get tough but make the most of the times when they get a little easier. 2. Set yourself a CHALLENGE. Be positive and be selfish! Is there something physically you have always wanted to do? But mentally you are telling yourself that you can’t. I hear it all the time as a Personal Trainer, and sometimes it does take an outsider to push you out of your comfort zone. Have you ever wanted to run a marathon? Or join CrossFit? Or maybe you would love to be able to do a pull up! So here’s the thing… you won’t be the best, you may even be the worst, but no one cares! The best thing about fitness training is that it is completely selfish. You are the only person who truly benefits from achieving your goal. And it is a great feeling when you do! Any kind of challenge wouldn’t be easy, and it shouldn’t be. You need to ensure that the challenge you set yourself is realistic, but also needs you to work outside of your comfort zone. Set yourself a time frame to complete your challenge, this will help you understand how you can make it possible. Physically your body may be too tired, there may have been a curve ball at work which was thrown you. Be willing to accept this and focus on how you can overcome it. Don’t just give in. Be committed to your goals and focus on the things you can control. Be physically aware of your body if it is tired, but mentally focus on what you can do to stay on track towards your goal. Remember every effort you make – no matter how small, counts! Physically we are capable of much more than we think, it’s the voice in your head that is stopping you from achieving more. As a Personal Trainer I hear ‘I can’t’ way too often. We tend to say this even when we have never tried the task before. So next time you even think about saying ‘I can’t’, think about the things you CAN do. If your mind tells your body that it can’t, well then it just won’t. Use past experiences of positivity to push you through the tough times. You’ve got this! CONTROL – Take the time to plan your week. CHALLENGE – Set yourself a goal that has to be challenging. COMMITMENT – Focus on the things that you can control. CONFIDENCE – Be positive, what you CAN do. Sometimes an outside source such as a friend or family member may be on a similar path to fitness like you. Talk to people and see how you can help each other. Getting help from a qualified Personal Trainer who is motivated, caring, and experienced in helping people achieve their fitness goals is also a helpful step. Want to find out more about how the military elites train their mental and physical toughness to gain razor sharp focus and mental clarity? Get in touch with me at UFIT one-north gym! Lizzie Corbett is an ex-Physical Training Instructor with the Royal Air Force (RAF) of the United Kingdom. She spent 9 years of her military career at recruit training bases where her job was to ensure all service men and women were fit for elite operations around the world. This consists of anything from developing the air crew conditioning programme for fast jet pilots, to loaded boot runs with front-line soldiers. As a coach today at UFIT one-north Gym, she uses her military experience to help her clients unlock their fullest potential. She understands how far she can push them physically, but also what it takes to achieve that mentally. 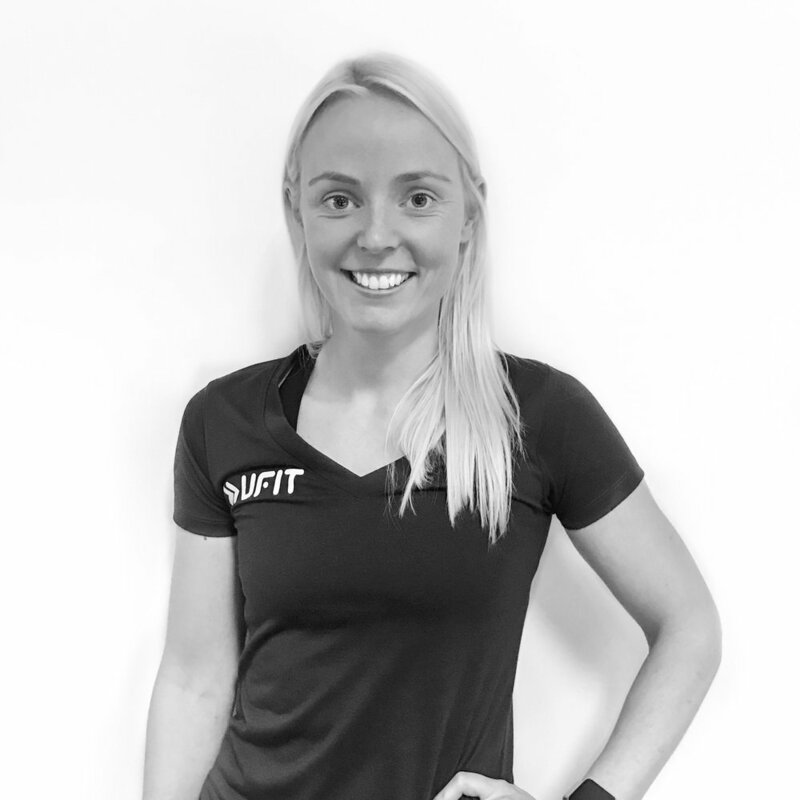 Her style of strength and conditioning training is based around fundamental movement patterns, getting the basics right, and progressing by following a structured training plan. Lizzie loves a challenge – from Ironman Triathlons to 40-mile ultramarathons, she’s pretty much swam, cycled, and ran every distance in between! For her it isn’t about the winning or breaking any records, it’s about seeing how far she can push her mind and body to achieve its maximum potential!